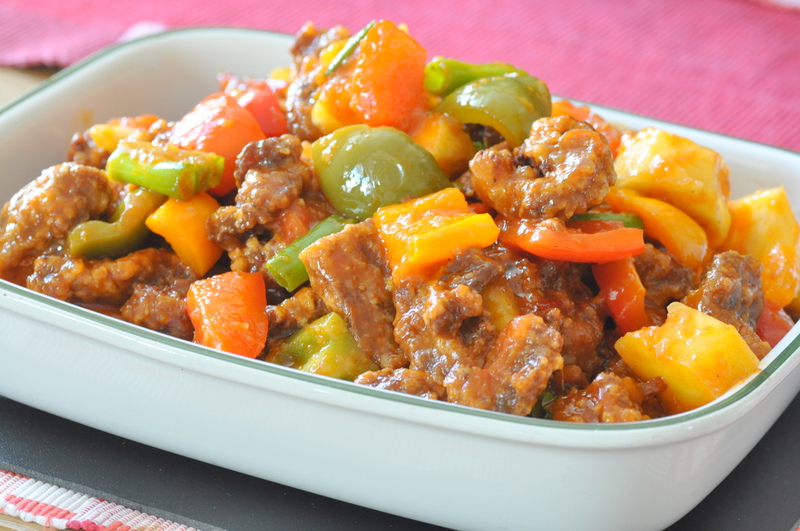 Szechuan style Sweet & Sour sauce with crispy pork slices. Sweet & sour sauce can be said to be one of the top 3 favourite sauces among the British population with sweet sour chicken being one of the most ordered food from Chinese take away shops. 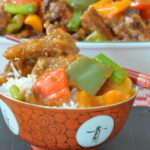 The Cantonese or Hong Kong sweet and sour chicken, whereby boiled pieces of chicken breasts are coated with batter, deep fried and served with a pot of sickly sweet sour sauce is most popular in UK. Some shop menus have it as ‘sweet sour chicken balls’. Whilst on holiday my boy has bought this a couple of times to snack on at night and more often than not we throw away the sauce and just eat the chicken with tomato sauce instead. The take away shops often put red food colouring into the ‘sauce’ with a lot of cornstarch slurry to thicken it. Tastes awfully foul. This Szechuan sweet sour sauce has been perfected over the years and it is one of my go to sauces for all protein sweet and sour. The only difference is that I use much more ginger for seafood. 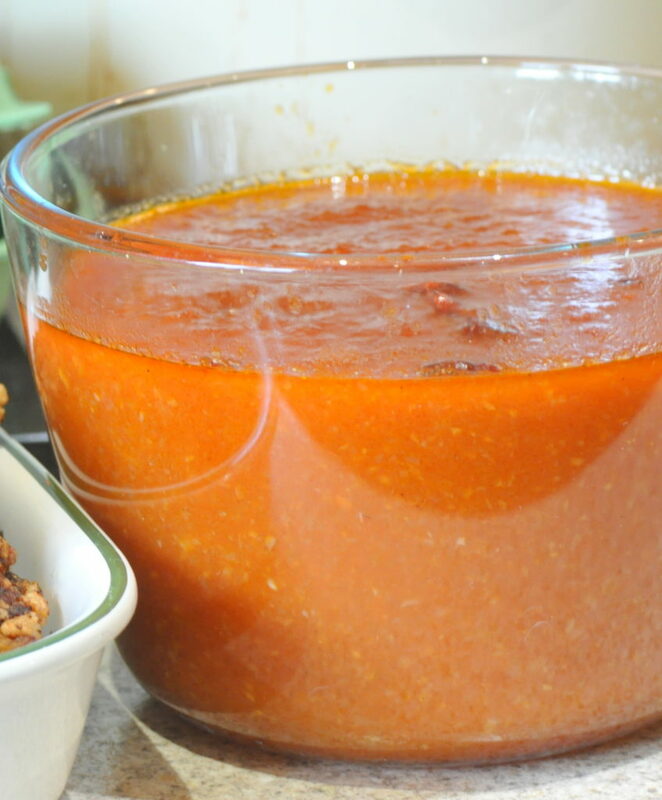 It takes a bit of patience and time to make this sauce but you can make a big batch and store it for a couple of weeks to a month in the fridge, or you can portion and freeze. Mix of any vegetables of your choice. 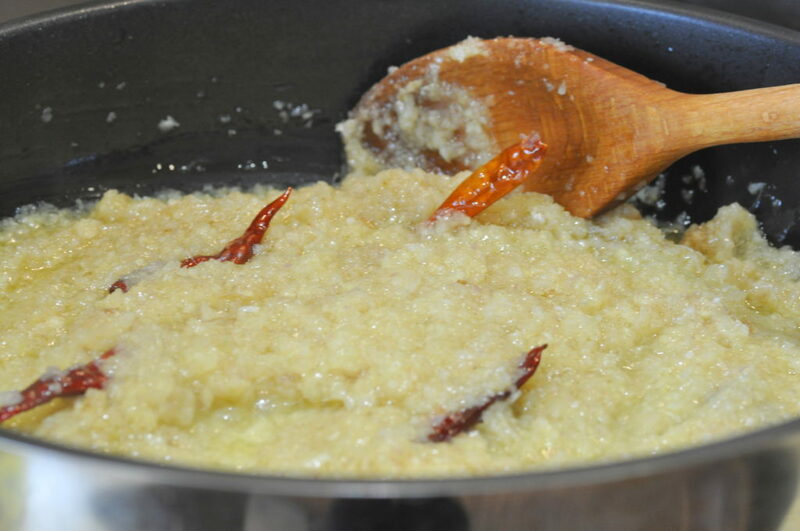 In a blender mince the onions, ginger, garlic, fresh red chillies and dried chillies. Leave some dried chillies whole for the amazing look. 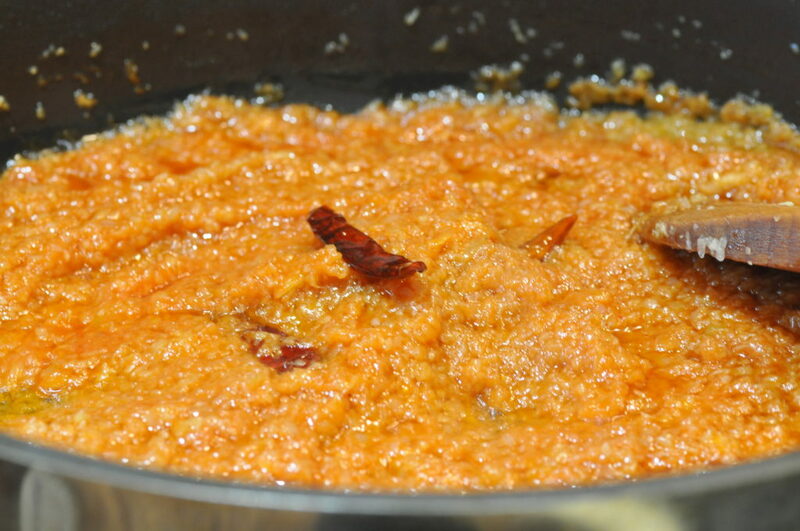 Heat up the oil and fry everything letting it all simmer for a good 10 minutes on medium heat till fragrant. 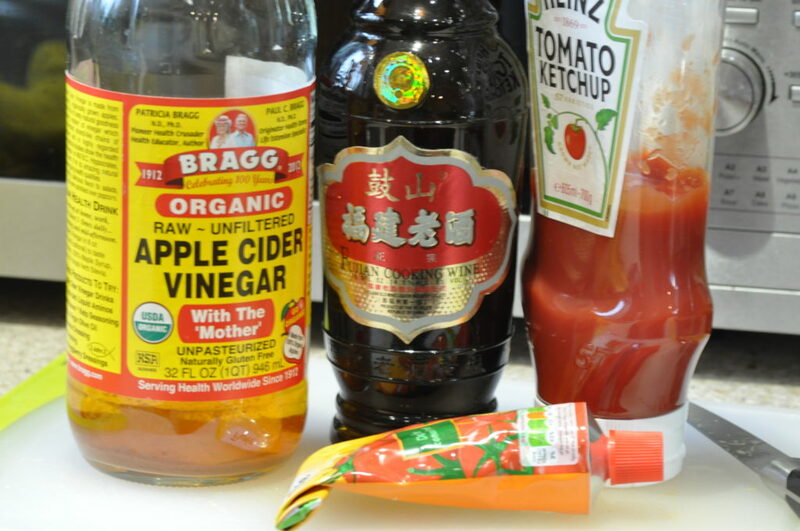 Add in the sauce ingredients – apple cider vinegar, rice wine, tomato puree, tomato sauce, sugar, soy sauce and water. Simmer on low heat for a good 30 minutes. Leave it to cool down and store in a jar. Slice your pork flat and wide. The surface area gets marinated and the crispy goodness! Marinate at least 30 minutes or in the fridge overnight. Just before frying, add in a beaten egg and the baking powder cornflour mix. The pork strips will curl and crisp up. Depending on how much you are cooking. I normally use 1 cup of ready sauce to 1kg of protein. In a wok or pan heat the sweet sour sauce. Make half cup of water + 1 tsp cornflour slurry. Add in your vegetable of choice and bring to a boil. Turn the heat off and then add in your crispy pork. Serve immediately sprinkled with green bits of spring onions. 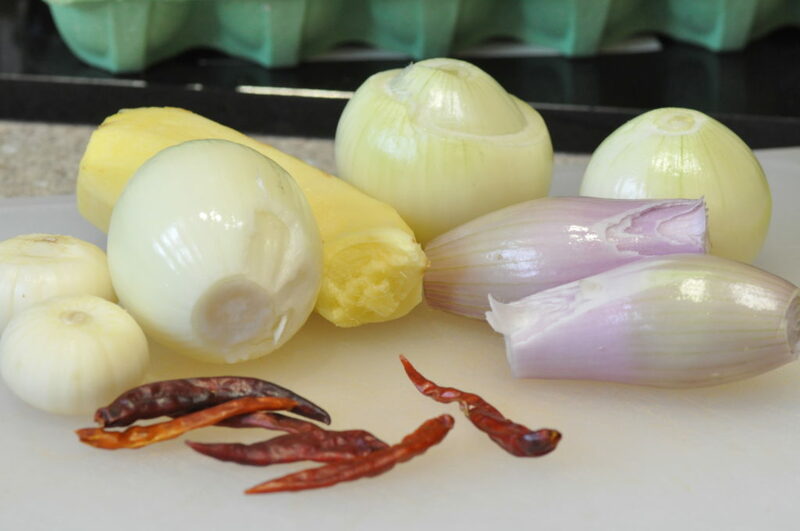 NOTE – In the recipe I have stated 3 to 5 onions. This depends on how big your white onions are. I would have preferred to to use the Asian onions but they are like eating ‘gold’ here in the UK. I like to use more onions because I like my sauce to have a bit more bite. 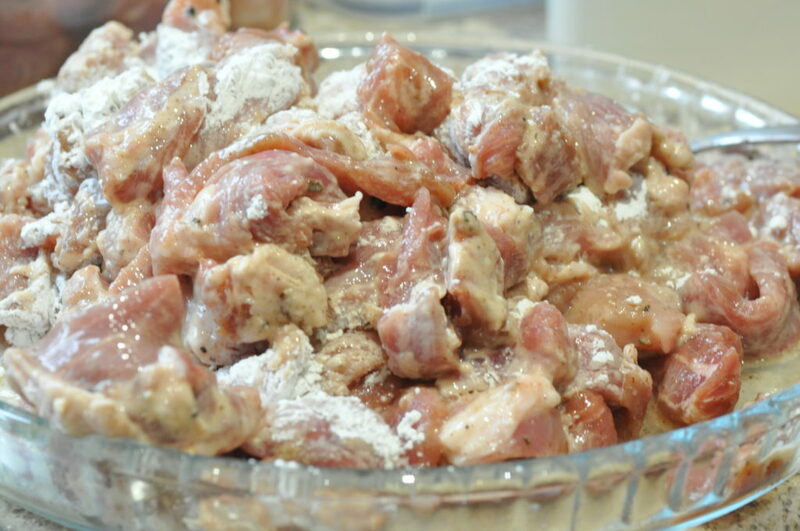 TIP – Adding in some cornflour slurry when assembling the dish makes the sauce stick to the crispy pork. 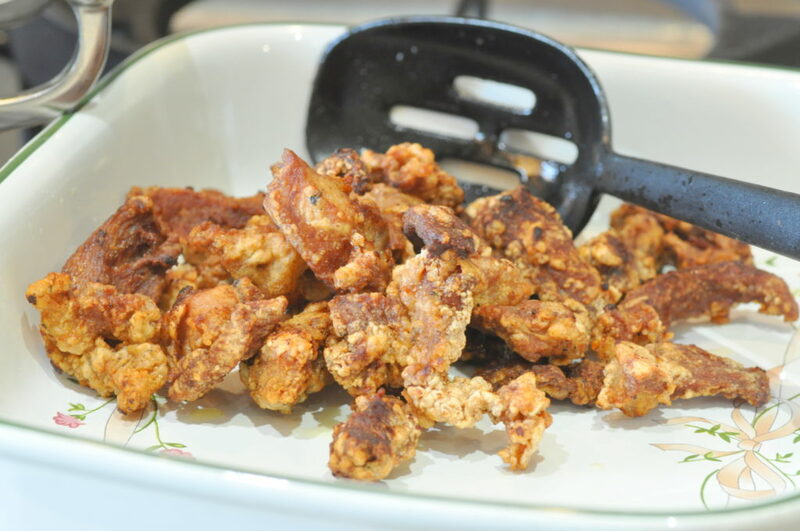 TIP – Assemble just before serving and add the crispy pork at the last minute so the pork stays crispier. Alternatively you can make the final sauce first then fry the pork strips. The sauce can be frozen.